I’d only ever heard it was possible to work amateur satellites with hand held radios, and all the accompanying photos usually involved waving around a modest sized handheld Yagi. 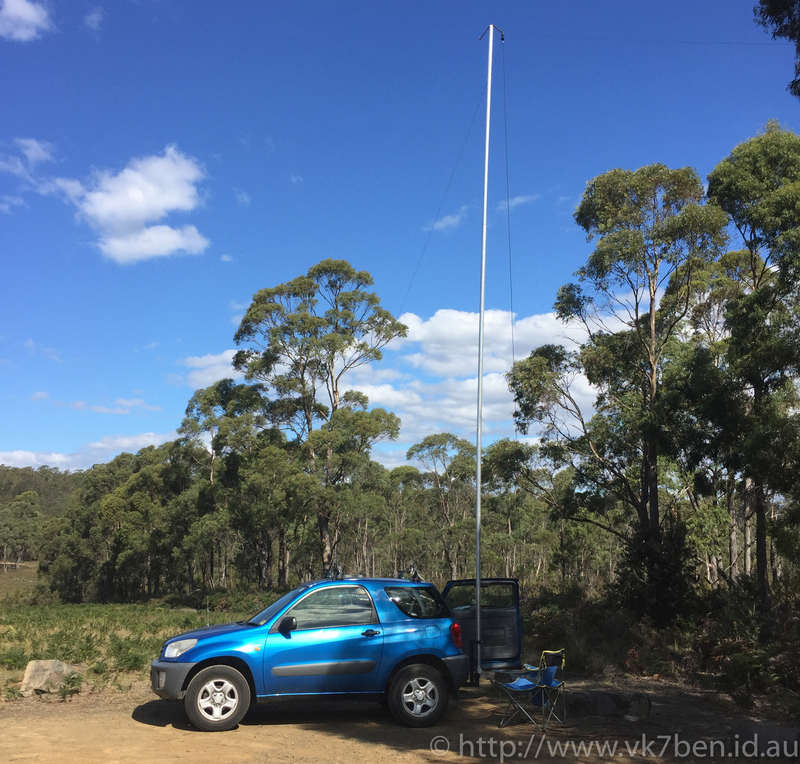 All that changed when I saw a posted a video posted on the Central Coast Amateur Radio Club Facebook page showing AO-92 being worked with Yaesu VX8 handheld with an after-market whip antenna. A quick check of the passes saw really favourable conditions to work AO-92 as it passed overhead on Friday 14th December 2018 from around 11.22pm local time. I quickly set up the frequencies in my IC-T90A, gave a couple of friends a heads up to listen for me and waited. We’ve had some fantastic weather down in VK7 recently, and today I decided to take full advantage of it with a solo trip to Mt Field National Park. This was mainly supposed to be a photography mission today, with the FT-817 thrown in “just in case”, however arriving at the park and seeing maybe around 100 cars I decided to put the photography on hold until later in the afternoon and headed up to Wombat Moore. The linked dipole was in the car today, as fun as the EFHW is, the Dipole is much easier to set up as free standing. 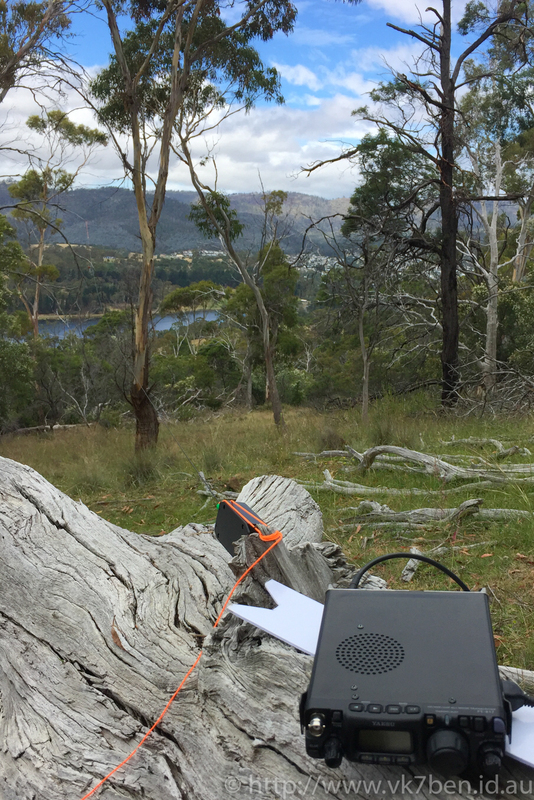 Today I finally got around to activating my first summit – Mt Wellington VK7/SC-001. 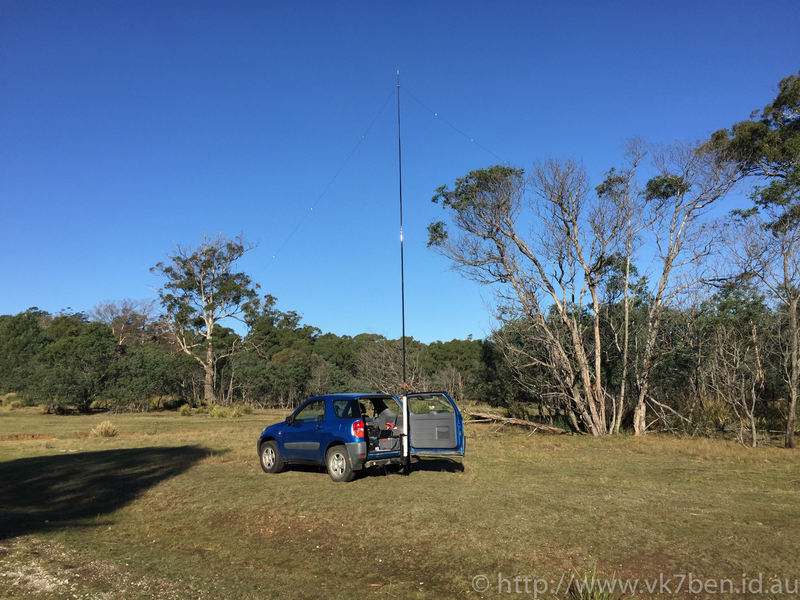 Given I had a “very long weekend” for Australia Day, I was determined that I would get some portable radio operations in over the weekend. A work colleague Richard, VK7FLCS, had also expressed an interest in seeing how easy portable operation was so the date was set for early afternoon to activate Mt Wellington, and then Mount Rumney if time permitted. I went away to the Tasmania’s West Coast in October 2016 and had hoped to work some stations. For radio, the trip was a bit of a disaster with the place we were staying having lots of solar inverter noise. The other thing was that it was very tedious to use a linked dipole in the location I was in. Since that day I had resolved that I would try and end-fed antenna and see how that goes. The End Fed Half Wave (EFHW) antenna is popular with many QRP Portable stations, particularly for activities such as SOTA or WWFF. The big drawback of the end-fed is the high impedances they have, which means that you need to carry some sort of Antenna tuner to match the impedance with the radio. The thought of lugging around an antenna tuner and then having to retune every time I switched frequency was less than appealing though. I had a day trip to Launceston today to assist a new amateur radio operator get on air with his HF rig. I decided that if I has some spare time left over we could stop by the nearby Trevallyn Recreation Nature Reserve and work a few contacts from it. VKFF-1156 is again somewhere pretty easy to get to, being part of the tourist trail in Launceston and giving access to Lake Trevallyn and the hydro power dam. Access is via sealed road and I ended up setting up of a flat area a couple of hundred metres up from the boat ramp. This also gave me an opportunity to try my new portable station. I have done away the the aluminium mast and Icom 706 as my go-to configuration and now have a squid pole, linked dipole and FT-817 QRP radio for portable operation. It all sounds suspiciously like I might be getting into SOTA soon! I will probably boost the in-car configuration with a QRP amplifier. This also gave me the opportunity to try a tweak to my logging set up by use Fast Log Entry to for WWFF. For those of you who are observant, yes that is an iPad, and yes that does look a lot like Windows! What I actually have is a small 7″Pendo Pad running Windows 8.1 (These can’t be bought any more) that I connect to iPad hotspot with, and then remote desktop to the Pendo tablet to run FLE. Its all a bit complicated, but FLE is the simplest way to log WWFF contacts effectively in an ADIF format. I’d love to say I jung around and got the 44 contacts, however the Tasmanian sun is very harsh and I was very quickly getting burnt. Also, the bands were incredibly open from that location – I could not find a free frequency to call on on the 20m band, with 40m being equally full. In the end I had to make do with just 3-4 contacts and the knowledge that I really need to go back again and do it properly. It’s been a little while since I have posted, and its not because I haven’t been doing anything. I’ve been getting my portable station even more portable that before. Ov er the past 3 weeks where I have had a spare evening I have been putting together a new portable station that is even more lightweight than the previous setup featured in my post on Peter Murrell Reserve. Key to this has been producing a linked dipole. 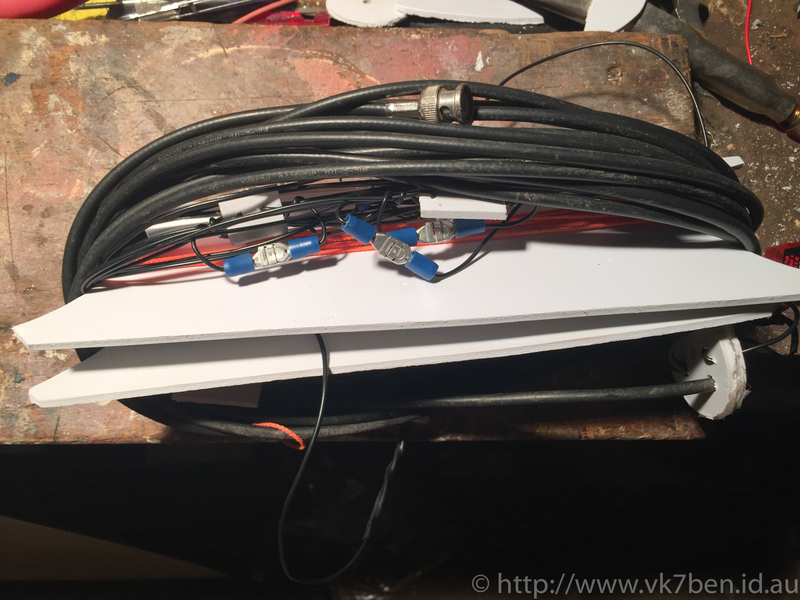 Linked dipoles provide the benefit of creating a single-wire antenna that is resonant on multiple bands without a tuner by “linking” together lengths of wire with clips. While there is no limit on how many links you make, it may not be practical to make the dipole suit everything between 1.8 and 450 Mhz. I ended up going for a 5 band antenna – 6m, 10m, 15m, 20m, 40m. As much as I am a fan of Summits On The Air (SOTA), activating a summit requires a level of portability that I am yet to obtain as well as a level of fitness that I am yet to obtain too, which is why I got pretty excited when I discovered the World Wide Flora and Fauna (WWFF) Program. Recently there have been a number of additions made to the Database for VK7, which originally was national parks only. The inclusion of a number of new conservation reserves meant that I was able to activate Peter Murrell Reserve which was only 30 minutes away as opposed to a significant 2 hour drive to the nearest national park. It also helped that the carpark fell just within the VKFF boundary. Being such a glorious day weather wise I made the spur of the moment decision to activate the park. Mobile test run at Mount Rumney. not a bad view! 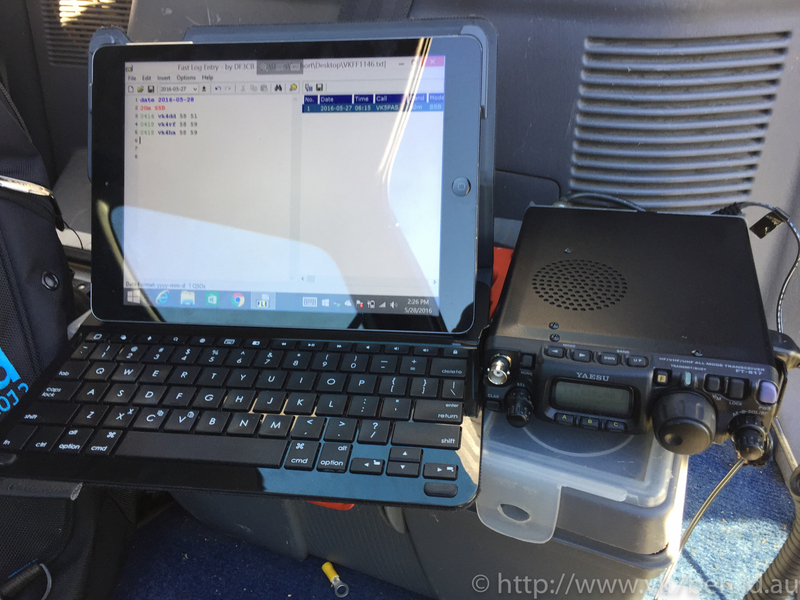 For a long time it has been a goal to take my own station portable to work HF. This week I finally achieved that goal. It’s taken me a long time to get there, with the project starting in 2006 when I purchased a portable aluminium mast for the car that can be assembled as high as 12m (39.3 feet). With the help of Bruce (ex VK7MBD) a custom tow bar mount was made, allowing the assembly and raising of the mast to be possible by 1 person. After this, things went quiet on that project as a result of my hiatus from the hobby.